Being silent will always help. While throwing tantrums, kid’s mouth is working and other skills like listening and thinking isn’t. So don’t waste your time to argue. Keep mum. You must be thinking that how stupid an advice it is? But believe it or not, this is one of the best ways to control tantrums. Don’t panic and just think that it is very normal for kids to throw tantrum. He isn’t trying to hurt or bother you; he is just being a kid. These little beings often fail to calm themselves down and thus the best thing to do when they are throwing tantrums would be to gently rubbing your hands over their heads or back and tell them that it is alright. Remember, a magical tight hug will always do the trick. Your expression, be it facial or verbal, will play a very crucial rule while tackling kids tantrums. Just show them that you understand what went wrong and that it made them angry. Empathize with them until they are calm and quiet. Usually kids throw tantrums because of stupidest of reasons but to them it can be a very serious affair. Validating their reasons for tantrum might make the child feel that you understand them. It seriously works. One of the biggest mistakes parents make is punishing their children for throwing tantrums. Never do it as this can backfire and make the situation even worse. If you really want to give them something tight then make sure it’s a hug and not a slap. 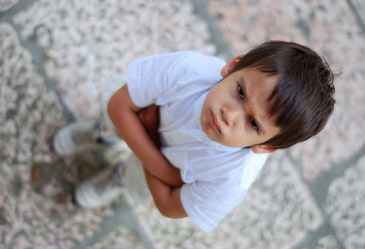 Often throwing tantrums turn ugly where the child may try to hurt themselves or others. The best thing to do at that point of time is to stand between your child and the thing they are hurting. Try consoling them until sadness and tears overcome the anger. Remember to teach your child that it’s normal being mad at something but hurting is bad. Support your children and try to politely convince them that the things they are asking for are not right. If they cry, let them as all of their emotions will let go with tears, saving none for later. The super awesome parenting styles mentioned above can incredibly help you in dealing with kids tantrums.